What a joke riders have to LITERALLY tell Muni operators how to do their jobs. Oh, you didn’t get the memo? Here it is. It’s no wonder this is one of the worst public transport systems among world class cities. When will Clipper Bots take over driving duties? Salmon Dave- I get that from a guy on the 1 a lot, too. 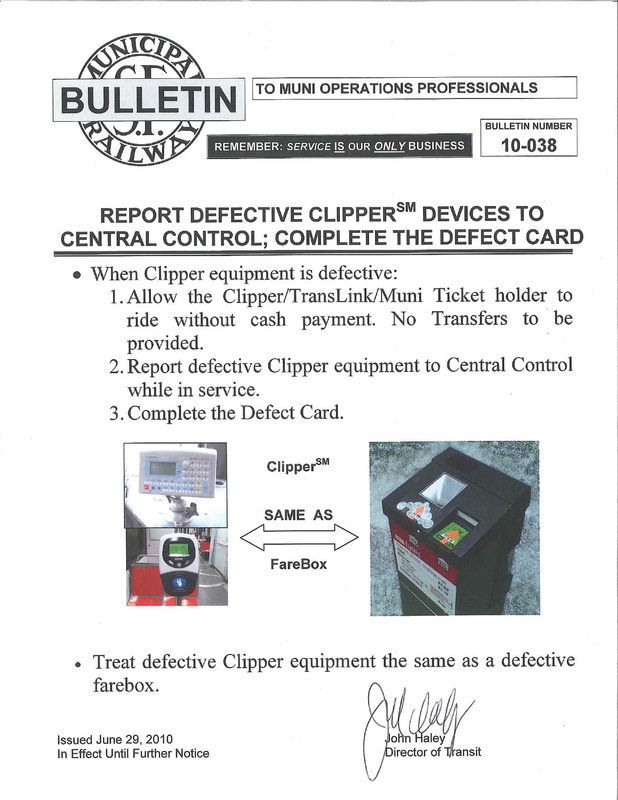 And yeah, it’s sad that I have to print up the memo but I really do think that the problem is that MUNI is just not disseminating info well to drivers. So I see it as an administration problem first, driver problem second. It’s ironic that I just read this post yesterday morning. Because when I got on the bus yesterday afternoon, the Clipper machine was broken. Yeehaw! Never had a problem with drivers letting me on with my card when the readers are broken, but boy are they broken frequently! I ride about 3 buses a day, and I’d put it at least 2 or three a week broken translink readers. From my casual observation, the breakdowns do seem to happen more frequently with the older buses.